Where do zombies come from? Director MR Chalermchatri "Adam" Yukol offers one possible scenario with Phi Ha Ayodhaya (ผีห่าอโยธยา, a.k.a. The Black Death), which mixes zombie-horror gore with the stately pageantry of the Suriyothai and Naresuan historical epics. The origin dates to 1565, during the reign of Maha Chakkraphat (husband of courageous elephant-battling Queen Suriyothai), when there was a plague in the old royal capital. The tropical malady was blamed on seafaring Portuguese and Persian traders, who sailed with the sickness upriver to the old capital. As far as public-health crises go, it was much worse, and way weirder, than is reported in the history books. The phenomenon is first encountered on the battlefield, where the clanging of swords place Phi Ha Ayodhaya comfortably within the realm of Thai historical epics like Bang Rajan and the recently completed six-part saga The Legend of King Naresuan. But then the piles of bodies of the recently slain begin squirming. They crawl to the merely injured and start chowing down. Flesh and sinew are torn apart, and one weary soldier, furtively witnesses it all. Wisely, he gets the heck out of Dodge. Meanwhile there's more of the traditional set-up for a zombie/slasher/horror flick, with an amorous young couple, their traditional wrap-around garb unwrapped, ambushed during a make-out session along a babbling brook. In swift order, the main characters are introduced. There's a young star-crossed couple - a nobleman's wilful daughter (played by Sonya Singha) and a bare-chested servant boy (teenybopper magnet Phongsakon "Toei" Mettarikanon). There's also a brothel owner (regular sneering baddie Chalad Na Songkhla), who is in conflict with a fiery hammer-wielding lady blacksmith (Wiri Ladaphan). He also pimps out a mute prostitute (wide-eyed starlet Arpa Bhivalai) who is favoured by a golden-hearted opium addict (Tonpon Mahaton), the husky-framed best pal of the hero. Folks start stumbling upon chewed-up dead bodies in the jungle and aren't sure what to make of them. Maybe it's a tiger attack. But the temple's abbot suggests it's the plague and villagers start fleeing. The zombie rules start out a bit vague. How long do the dead stay dead? But eventually the mouldering and munched-upon do wake back up with blank grey eyes and an everlasting hunger for living human flesh. It's a fact of undeath. With the city overrun by zedheads, it's up to a disparate band of the still-living to hold on and hopefully survive the night. Barricading themselves in the brothel, the core characters are joined by that weary bearded soldier who knows exactly what he's up against. Portrayed by Gandhi Wasuvitchayagit, he's a swift swordsman who doesn't hesitate to lop off zombie heads. It's the only way to kill them. Today we all know that, but this was 450 years ago and nobody had a clue. This warrior was on the cutting edge. Filmed in Kanchanaburi, on the massive period sets where Adam assisted his father, director MC Chatrichalerm Yukol, on the Naresuan epics, Phi Ha Ayothaya has the feel of a low-budget B-movie, with multi-hyphenate Adam taking credits for the bulk of the chores behind the lens. Though, as noted in the credits, it was still a big deal, creating some 3,000 jobs for extras, film crew, caterers, transport, etc. The action is a bit off-kilter and comic-book like. For example, the lady blacksmith decides to ditch her swords and use heavy hammers, one in each hand, and bust zombie skulls. She earlier speared a tree with a molten-hot sword. Meanwhile, the brothel owner has a muscle-bound, bare-chested bodyguard. He trades action-movie banter about duty and honour with the grizzled battlefield veteran, and somehow grabs up a huge cannon, which probably weighs a ton, and actually fires the thing and remains standing. Later he uses it like a baseball bat to swat zombie flies. There are plenty of zombie-gore effects, but they are mostly confined to tightly framed segments. So there's a close-up of a head being split here and a zombie's forehead bisected there. The better parts are when zombies fill the frame and surround their victims, like ants swarming over a sugar cube. The sound design contributes greatly to the feeling of dread. There's an aural sense of rubbery skin being stretched and bones snapped, but the overall audio cue is the zombies' terrifying roar, which sounds like a mix of a tiger and the dragons from Game of Thrones. 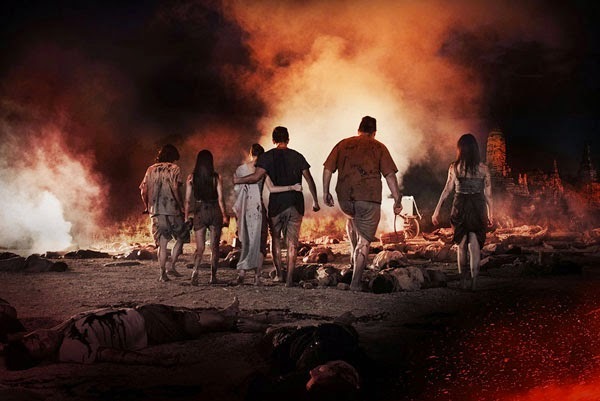 Adam probably deserves credit for making the first honest-to-goodness Thai zombie movie. Thai cinema has always been about Thai ghosts, of which there are many. Zombies, which are cinematically traced to George Romero's Night of the Living Dead (1968), are a relatively new genre. They've staggered in a couple times before, in Taweewat Wantha's ridiculously fun SARS Wars from 2004 and 2011's Gancore Gud by rapper Joey Boy. But while those films had various forms of shuffling dead-eye ghouls, I'm not sure they actually said they were zombies. Adam's film does use the Z-word. It crops up in the subtitles whenever someone says phi ha. Anyway, the plot is definitely inspired by Living Dead, which had bickering characters trapped in a farmhouse. Romero's follow-up, "Dawn of the Dead", was set in a shopping mall, and Edgar Wright's comedy tribute Shaun of the Dead had its heroes hanging out in a pub. Phi Ha Ayodhaya manages to channel those films, and for a moment I thought I heard a Queen song playing on the soundtrack. The Thai spin on the zombie tale adds a bit of Buddhist spirituality, in which only those who survive let go of their sentimental, mortal attachments to friends, family and other loved ones. For those who linger in the embrace of the dearly departed for too long are surely doomed to be bitten themselves. It's best to chop off those heads before they turn. Please, no questions or comments about where to download movies or subtitle files. Please read the FAQ about Thai films on DVD before asking about where to find a Thai movie on DVD with English subtitles. Make your comments pertinent to the post you are commenting on. For off-topic comments, general observations or news tips, consider sending an e-mail to me at wisekwai [ a t ] g m a i l [d o t ] c o m.
All comments are moderated. Spam comments will be deleted. New Delhi Snapshot: Fortune Teller and his Smartphone - Spotted recently here in the Indian capital: a fortune teller consults his smartphone. - HAPPY YEAR of the PIG! 1/5 = Waste of time. Blog header image from production still of Uruphong Raksasad's Agrarian Utopia, used by permission of Extra Virgin Co.
วารสารหนังไทย ของ ไวส์ควาย Blogging about Thai cinema since 2003. Simple theme. Powered by Blogger.